One of the reasons I bought a vintage motorcycle was because I wanted to work on it myself — to know its machinations and quirks, and to care for it with my own hands. When I bought my beat-up 1980 KZ440, I hoped I would be able to repair it myself. But it turned out to need much more than a basic tune-up. Handing the bike over to GT-Moto to be rebuilt was bittersweet. I knew Sofi would do a phenomenal job, and I was excited to see what it would become. But, I was also a little disappointed that I wouldn’t be able to bring it back to life with my own hands. Sofi, as expected, created an amazing motorcycle, one that I am humbled to own. But, in the months after the rebuild, the bike felt foreign to me. It was like someone else’s child, who I could love and appreciate but didn’t truly know. Through my first year of post-rebuild ownership, I waited anxiously for tasks I could conquer myself. After 500 miles, I changed the oil, and was hungry for more. At 2,000 miles, the starter motor stopped spinning, and I dove in headfirst. But then came 4,000 miles, and it was time for its first major scheduled maintenance — i.e., my first chance to get down and dirty with my rebuilt motorcycle. I tore into my Clymer manual and Haynes maintenance textbook, only to discover my maintenance interval was actually 3,000 miles, not four. Whoops. Better late than never? The first thing I did was change the oil and the fuel filter: no surprises there, I’d done it before. I finished the oil change after work on a Friday, and planned to take care of the rest the following day. The next morning, I woke up at 8:30 AM and headed out to the garage, cup of coffee in hand. For the next six hours, I went back and forth between my manual, the techbook, and my bike, checking and double-checking the instructions. I second guessed myself on everything. Why is the lubricant spurting out the top of the cable lubricator? Has this bracket always been here? Where is the “small inner screw” I’m not supposed to use to turn the engine? How can I be sure I’m not using it if I can’t find it? Although I had spent hours reading my techbook and manual in preparation, I still had concerns. Most of my questions were trivial, but I was so afraid of messing up I couldn’t help but ask them. After hours of hedging, I worked my way into a “just do it” attitude, which lead me to loosen my clutch cable so far that I had to remove the chain cover to put it back into place — which of course required removing both the footpeg and the shift lever. Not a huge problem, but time-consuming. The real trauma, though, started when I went to check the valve clearances. At first, I put off the valve clearances because I thought I would have to remove the alternator cover to turn the engine, which meant I’d lose some of the fresh oil I had added the day before. So, I decided to put it off until the following week. A week later, knowing what I had to do, I removed the alternator cover, and fresh oil came spilling out. I told myself next time I’d know better. I’d check the valves first. Then I turned to my manual and realized… I didn’t have to remove the alternator cover at all. The ignition cover allows access to the crankshaft, so I can turn the engine from there. I had delayed the check for no reason at all, and wasted half a quart of good oil. How had I missed that? Next time I will know better, indeed. But that was hardly the worst of it. Once I got into the valve check, things started to go south. Feeler gauges, though they appear to be straightforward tools, actually require much more skill and practice than I realized. At first, I tried to jam the gauge in straight, and got absurdly tight readings as a result. I texted Sofi in a frenzy, sure I was missing something. In fact, I was. I didn’t realize that the gauges needed to be flush against what you’re trying to measure. Even after I had bent the gauges to sit flat against the valves, they still appeared to be much tighter than the specs in the manual. For awhile I went back and forth about it — my bike was running fine, was it wise to mess with it? But then I decided that maybe the valves had been too tight all along and I’d never realized it, because I didn’t know the symptoms. I decided to loosen them to the low end of spec, and took great care to ensure I got the most accurate readings possible on the feeler gauges. Whether the manual specs were off or I got the measurements wrong, I’m still not sure. What I do know is that my valves are now much too lose, and I have an oil seal replacement job on my hands. Two weeks ago, I set out to ensure my bike was in perfect running order. Instead, I created a problem bigger than any I’d yet faced. It’s not a great feeling. As I’m writing this, I’m flushed with embarrassment. But you know what? I will survive. My KZ will survive. From the stories I’ve heard, there’s not a mechanic alive who hasn’t had to solve a problem of their own making. Was it a rookie mistake to mess with the valve clearances on a well-running machine? Definitely. But it’s happened, and I can’t do anything now but fix it and move on. The silver lining is that I now have a better understanding of how my engine valves work. And, really, that’s what this is all about. I’m on a journey to learn more about motorcycles, and to get to know my machine with my own hands. The learning is what matters. And, indeed, I have learned a lot. 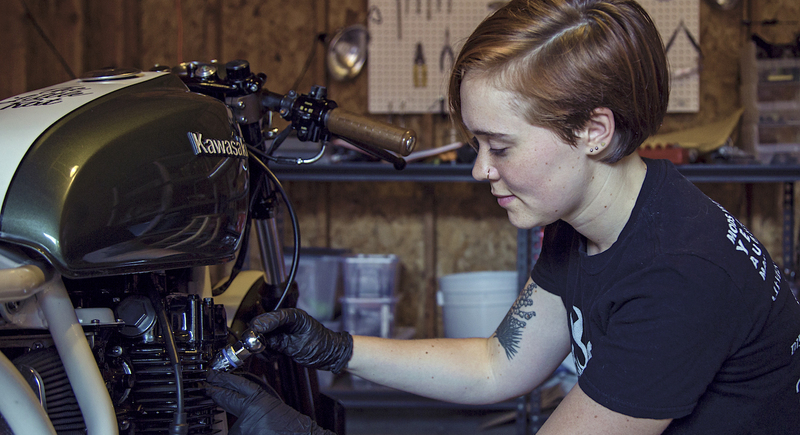 Ready to start your own custom motorcycle project? If you want to build your own custom motorcycle, but you have no idea where to begin, I wholeheartedly recommend the resources created by Matt McCleod at Krank Engineering. His empathy and enthusiasm will provide the direction, support and guidance a newbie mechanic needs. Plus, when you join his community through the link below, part of your membership will help support the RIDEWELL blog. Thank you! Being an affiliate for Matt’s community helps me continue to create quality content for readers like you. If you’re interested, you can read more about my affiliate policies here. Don’t feel too bad. I’ve been a tech. for 20 years but when I work on my own vehicles, especially bikes, I always seem to have problems. You definitely want to make sure you are on Top Dead Center (TDC) between the Compression and Power stroke, There is usually something called valve overlap between the Exhaust and Intake stroke which can mess up the readings. I used the timing marks on the timing plate, and it seemed right but you never know? Either way, I’m going to get through replacing the oil seals first before I worry too much about getting the valve clearances right again haha. I know my builder advanced the timing slightly after the rebuild so maybe that has something to do with my mistake? I’ll figure it out eventually 😉 Thanks again!! As odd as this may sound, I’m mentally drained having read this story … that’s a VERY good thing! I am grateful, not only for the experiences you so graciously share; but also for your ability to chronicle those experiences with such vivid, nearly three-dimensional detail. Your stories have always left me, at once, entertained and educated; but these last couple have left me feeling challenged as well – challenged to keep improving on my own “model” by continuing to learn and push past my comfort zone. Self-improvement is a deliberate process fraught with pitfalls (external and self-made); but with education, grit, God’s grace and maybe an occasional lifeline from more experienced people like GT-Moto, we can we can each conquer our own respective mountains. Thank you for the opportunity to learn from your mistakes, feel your experiences, and celebrate your successes. And thank you for continuing to bring us on this journey with you. And as odd as it may sound, I’m glad you felt drained — because I definitely was, too! 😉 Take care, Ohene! Ooops, Enter key pressed by mistake.